Much ado is being made over two lady politicos these days, Sarah Palin for her six-figure fees and Nancy Pelosi for her legislative expertise. Both are commendable — depending on how one chooses to commend — but unfortunately they are continuing to feed the politics of scorn. Which is unlikely to lead to bi-partisanship or collegiality any time soon. Maybe both are dead. Palin’s usefulness to her party is a matter of dispute. According to two prominent speakers at a Wednesday breakfast sponsored by the Christian Science Monitor (as reported by Monitor writer Dave Cook), Palin’s rise is great good news for the Democrats. In the aftermath of the passage of healthcare reform, the ongoing discussion is “Barack Obama against Sarah Palin on healthcare,” he said. Much as some of us do not admire Sarah Palin, the sneer factor employed by her detractors can be oppressive. (Come on, if you’re an anti-Palin, think of the slurs you have slung her way.) She is, herself, a master of derision in a by-golly sort of fashion, and it is this that brings loud huzzahs from her audiences when she takes on the Democrats. … saying they “have nothing to sell” to the American people except a crude caricature of her as the midterm elections approach. Pelosi, D-San Francisco, was surrounded at the Phillip and Sala Burton Center by ardent advocates of health reform, who cheered when she was cheerful and roared when she was defiant. And she was proudly defiant. “This is a bill about the middle class. This is a bill about small businesses. 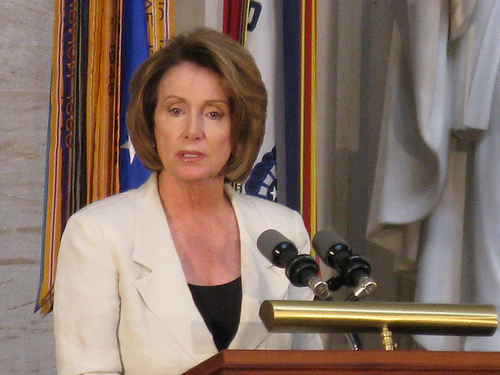 This is a bill about affordability,” Pelosi said. Appearing before a crowd dominated by seniors carrying signs of appreciation – “Thank you, madame speaker” – Pelosi was lauded by a parade of admirers, including Rep. George Miller, D-Martinez, doctors and senior advocates who praised her tireless push for the measure. Admittedly, Pelosi was in friendly territory this week, as Palin has been in recent days herself. Palin last weekend put Pelosi and Democratic Senate Majority Leader Harry Reid at the center of her campaign-style speech to Tea Partiers attending a rally in Searchlight, Nev., Reid’s hometown. “You’re fired,” she said of the two Democratic standard-bearers. This may be the way politics works. But wouldn’t it be nice if occasionally, some way could be found for opposing sides at least to be civil in the interest of the common good. The difference, as I see it anyway, is that Palin is attacking Pelosi by spreading lies and Pelosi is attacking the lies. Of course, since both are women, both are being called b*tches by their detractors, while for the men its business as usual. Until the money is taken out of campaigns, this will continue to be the case. These sound-bites are for the media and to be used later in their ads. Until we get publicly financed elections and instant run-off voting, our politicians will continue to behave like this. I maybe wrong, but I would love to find out. I’m with you. Wish I thought it could happen in my lifetime… but here I am watching Meg Whitman spend millions and millions in a bizarre obsession to become governor of a state in which she has rarely bothered to vote. A voice of the people? Sheesh.